Mindy Kaling attends the 2019 Vanity Fair Oscar Party hosted by Radhika Jones at Wallis Annenberg Center for the Performing Arts on February 24, 2019 in Beverly Hills, California. Mindy Kaling matched her shimmering dress with a silver box clutch. 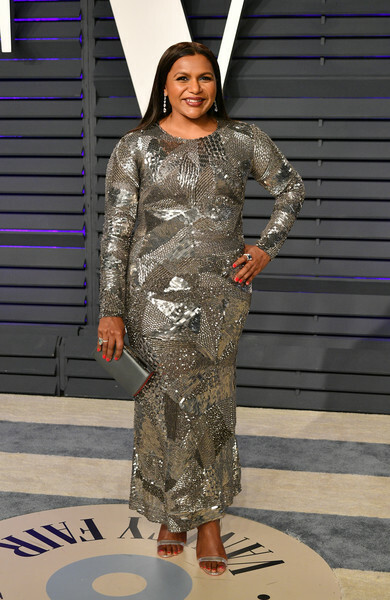 Mindy Kaling looked festive in a silver patchwork-sequined dress by Alberta Ferretti at the 2019 Vanity Fair Oscar party.